In my previous post, I spoke about faith and about the dream I had that could have been taken as an outer body experience. Dreams are dreams, right? I also spoke about whether or not a spiritual experience was just a burst of euphoric events in our brain, giving us a "god-like" presence. I did forget one thing that let me know that there was indeed a god, or at least, a place where my Dad was being taken to. It was last year, on a Saturday, July 21rst. Dad was in hospice and not expected to live much longer. I was there all week, and needed just to breathe in the morning, have a peaceful breakfast outside with Madelene and then head up to say my final goodbyes. As I said before, most of my relatives die on the 21rst of whatever month. I wanted to wait after 12:21, because it's a number I see all. the. time. when I look at the clock. It happens too often. After 12:21, I would head up to where Dad was. At 12:21 pm, this moth came flying down and onto the picnic table that I had my coffee on. 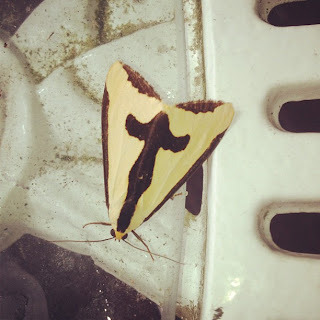 I stared at it because the color was so unique and the texture almost looked like it was made out of wood, but as I looked a bit longer, I saw that it was a descending angel - it looked as though she was raising her hands about to lift off into the sky. Again, like I said in my previous post, it's like seeing Jesus in a groove in some oak tree or a piece of toast that has the Virgin Mary on it. But take a look at the image. And, on 12:21pm. Then, moments later, my sister called me and said, "Deb?...............He's gone." It says in Matthew 17:20, "'You didn't have enough faith,' Jesus told them. 'I assure you, even if you had faith as small as a mustard seed you could say to this mountain, 'Move from here to there,' and it would move. Nothing would be impossible.'" The problem I see with this is that it is impossible to move a mountain. Literally, yes...I guess you can say 'you have to read more into it', but what about having faith as little as a mustard seed? Does it mean we can kinda-sorta believe in God? What if our faith is flawed or doubted in any way? In Christianity, if you don't believe, you don't go to heaven. There are so many flaws to "religion" -- or should I say "unbelievable" stuff, and perhaps many contradictions to the rules. See, I want to believe Dad went to heaven and that he's in a much better place -- as the ol' grieving cliched advice goes, but I guess it's normal to want more proof. Don't get me wrong, I still believe and I still pray, it's just that small percentage in my brain that says, "What if?" I received a few emails from my readers asking if I was okay. I'm writing what I've been tossing around in my head for some time, maybe to get feedback, maybe to just vent, or maybe...to have God hear me, or better yet, read me. Have you ever wondered what keeps your faith strong --- in anything --- what keeps you still believing in whatever it is that you believe?